Fastest, easiest way to run your golf organization. Your golf organization anywhere, anytime, on any device. Requires a PC computer with Windows. Automates the entire process of running your golf leagues. Includes scheduling, standings, handicapping, and more. Easy to learn and use! Watch the demo videos to see for yourself. The demo takes only a few minutes to view. Current customers - click on "Updates" to see what's new. Includes 1 year trial of "Par" Service. Automates all aspects of running your tournaments. Sign up golfers, build pairings, print cards, play golf, show results, and much more. Intuitive and flexible. Saves you time! Check out the demo videos to see for yourself. Track handicaps and information for your membership. Calculate handicaps for any number of golfers. Current customers - click "Updates" to see what's new. 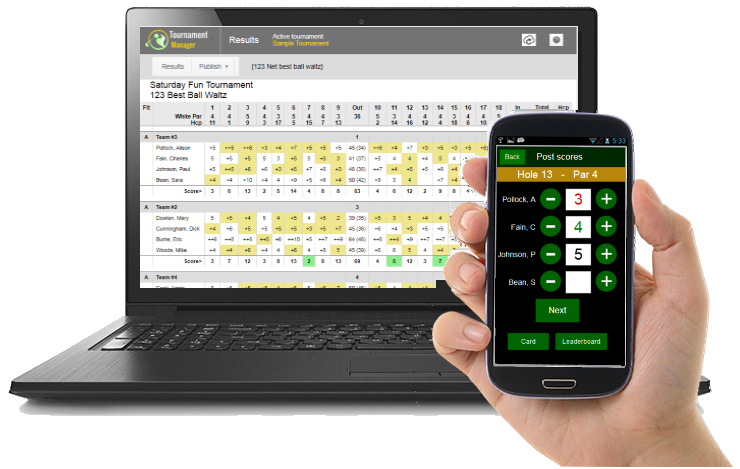 Providing the best golf league, golf handicap and golf tournament software since 1988.